Dear Friends of Guthrie’s Territorial Christmas Celebration, our next meeting will be Thursday, October 25, at 6:00 at 115 N. 2nd St. Please come join us! We will be having some great events in the near future, and you can be a part of them! ~Victorian Style Show will be at 2:00 on October 28th at The Scottish Rite Temple, in the Egyptian Room. Tickets will be $10. ~Christmas Tree and Wreath Auction at The Carnegie Library! November 10, 6:00. $10 at the door… refreshments provided. If your group, club, team, church, work, or family would like to donate a decorated tree or wreath, please contact The Chamber of Commerce at 405 282-1947, or James Long at 405 627-8239. 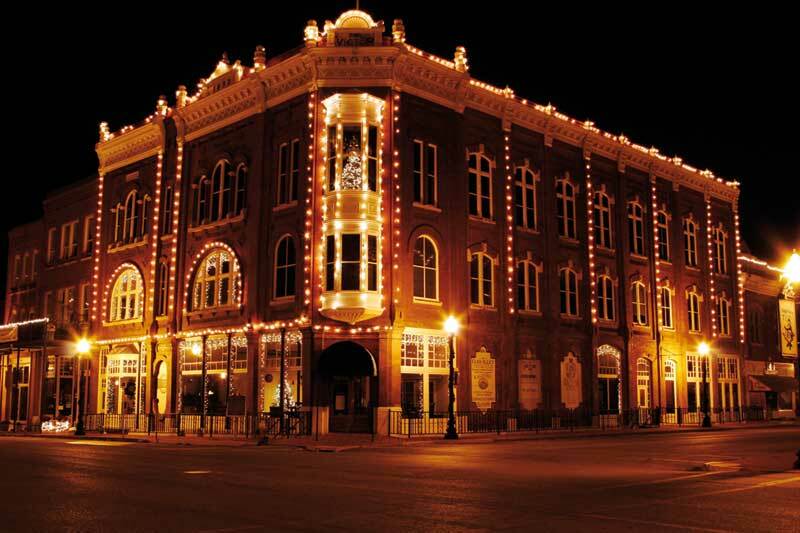 ~Lighted Christmas Parade will be December 1, beginning at 6:00. If you want to enter the parade, call 627-8239 and leave a message for Ms. Stone. ~Opening Night and the inauguration of our new Territorial Governor will be after the parade. Be sure to get out and vote for one of the well qualified candidates that are running now! Your vote really does count!! ~The Homes Tour will be on the 8th of December! We always have a huge turnout for this event! If you would like to volunteer in a home, or would like your home to be considered for the tour, please leave a message for Sharen Bowers at The Chamber of Commerce – 282-1947. ~The Living Postcards (windows) will be a big hit on both Victorian Walk nights, if your organization would like to do a window scene, please leave a message here, as well! ~We will need help in decorating downtown, making sure that the lights on the buildings all work, organization of all events, volunteers for the Homes Tour, folks to fill the windows, folks to fill the streets, folks to perform, folks to get their churches and clubs involved, and most importantly – folks to enjoy the festivities!! This is your town!! Let’s make it a real community event! Get Involved!!!!!!!!! Volunteer Here!!!! The Gaylord and Linda Thomas Home – 1403 W. Cleveland Ave. The Cordis Home – 519 E. Cleveland Ave.
Magnolia Manor/ Magnolia Moon (Gary Good) – 323 W. Cleveland Ave. The Gerald and Clara Duehning Home – 623 E. Cleveland Ave. The Scott and Kelley Wyskiel Home – 123 S. Capital St. The Carnegie Library – 406 E. Oklahoma St.
3 Responses to "Territorial Christmas Celebration layouts line of events"
Chris, I just saw a typo …the style show tickets are $10. Thanks for your support of the Territorial Christmas Celebration! Asa Nelson told me that you were going to join him, Mary, and Ben in the lift when they start checking the lights! Thanks for your involvement! Thanks Lucy – I will defintely be in touch with the person who gave me this erroneous information.